Sebastián: No, cause it brings bad luck! Star vehicle for both stars. 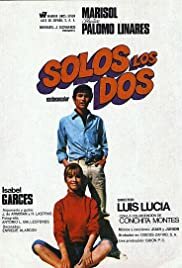 SOLOS LOS DOS pits star bullfighter Sabastian Palomo Linares and box office star Marisol into a contrived story about the hardships of loving a man who is always in danger. Once the courting begins Sabastian and Marisol take walks in the park, walks in the town, look lovingly at each other and she sings songs. Once he goes back to work Marisol mugs at the camera, swings her hair, squints, cries, takes long walks in the park, takes long walks in the snow and looks longingly at the lover she may never be able to keep. This love story looking for a plot is really a 91 minute music video with the camera annoyingly flying up to the sky after every scene. For Marisol and Linares fans only.